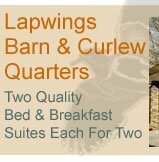 Welcome to Lapwings Barn/Curlew Quarters, Bed and Breakfast Suite Accommodation in Whinfell, near Kendal, Cumbria. Whinfell Cairn is a good walk from the accommodation, 1½-2 hrs to the top from the barn at a slow pace, and considerably quicker coming down! You can return to sit out on the balcony with a cup of tea, look up at Whinfell and marvel at what you achieved. It is a very quiet location despite its proximity to Kendal. There are beautiful fell views from Lapwings towards Selside with pine-woodland and bracken. The owners speak Spanish and some French (one of the owners is a Cumbrian).